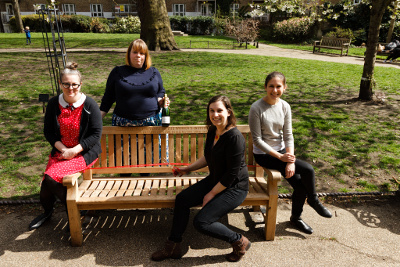 To celebrate an amazing 100 years of the Women’s Institute (1915 to 2015), and 10 years of N1 WI (2006 to 2016) we wanted to do something which would give back to our community and also give Islington a permanent tribute to the Women’s Institute. After careful consideration, it was agreed that the best way to commemorate this special event would be to provide a new bench for anyone and everyone in the local community to enjoy. After fundraising over the last couple of years, the majority of which has been done in typical WI-fashion of selling homemade cakes and biscuits, we’re so pleased to finally have our commemorative bench in place just around the corner from where we meet. 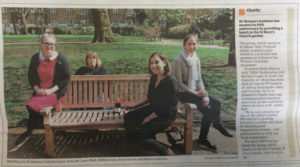 A few of us met up earlier in the year to have a bench opening with cake, fizz and ribbon cutting, and managed to be featured in the Islington Gazette! 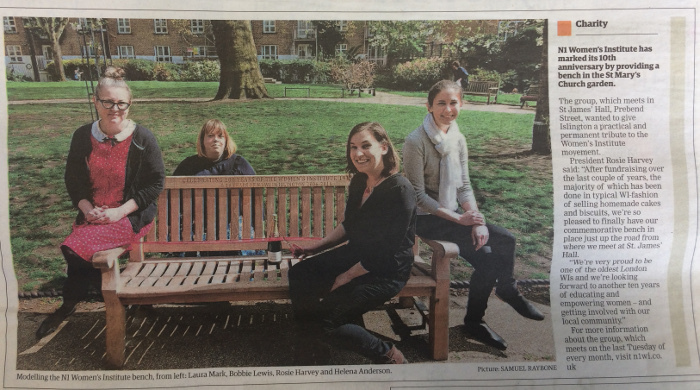 Our lovely new bench is in the park just behind St Mary’s church on Upper Street in Angel, just about here. It’s there for all to enjoy a sit down in a (hopefully) sunny spot! Photos thanks to the lovely Sam Raybone!